The other day Chris and I were doing some shopping at our local Costco. The one closest to our home offers beer and wine in a separate part of the store so we often like to walk in and check out some of the wine they have for sale. There have been many times some of my favorites are there and are priced very reasonable. 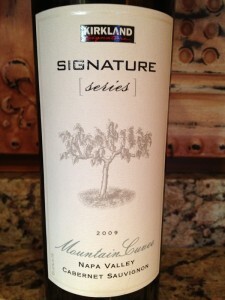 This time I came across a bottle of the 2009 Kirkland Signature Series Cabernet Sauvignon. I grabbed the bottle out of curiosity and read the front and back labels. Chris picked up on the named wine makers and after reading the lables that I had a pretty good idea where the bottle came from. Sorry but I am not going to say which winery. Since I had a pretty good idea of who and where it came from we decided to buy a bottle and give it a try. If it is the Cabernet Sauvignon I think it is, the $20 price tag is about $15 less than the regular bottle at the winery under it’s own label. I bought a bottle and decided to open it up on Friday with Chris and Dave when we would rate it. I also emailed some of my friends and gave them a heads up. For the price I figured you could not pass it up. Friday came and we had dinner at our house with Dave and Heather. I had brought the bottle up earlier and it was time to cut the foil and pull the cork. I poured the three of us a glass and I grabbed my tasting sheet so we could rate the 2009 Kirkland Signature Series Cabernet Sauvignon. As you see the Cabernet had a nice Garnet color. It was clear and there was no sediment in any of our glasses. 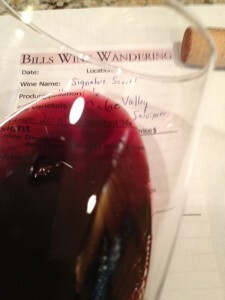 The 2009 Kirkland Signature Series Cabernet Sauvignon was very aromatic to my surprise. It smelled very fruity. There were Cherry, Blueberry and dark chocolate hints when we smelled the wine. The Cabernet was soft and not dry. The Cabernet was almost full bodied. The acidity was lively (my mouth salivated). The tannins were medium and were felt in our mid palate. It was very flavorful with a long finish. Some of the flavors were Cocoa, and a slight spice. We also noticed the 2009 Kirkland Signature Series Cabernet Sauvignon paired very well with the food the girls were prepping that Dave and I were sneaking. I think you could drink the Cabernet on its own but it would be better with a nice meal. We rated the 2009 Kirkland Signature Series Cabernet Sauvignon three glasses. For the price you cannot go wrong buying this wine. I plan on visiting our local Costco wine and beer store more frequently and watching the labels with an open mind. I would try your local Costco or try looking for it on-line.